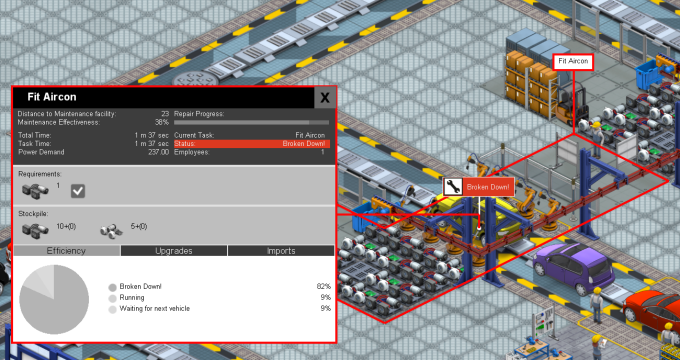 For a long while I have talked-the-talk about putting slot breakdowns into Production Line, but recently I’ve actually been doing the code, and I now have a working implementation in the game, ready for imminent release to the unstable build on steam, and eventually the full early-access alpha build. The implementation is fairly simple to describe. basically slots break down for a random duration between X and Y, and you can research and then place down maintenance facilities that vastly reduce that repair duration so that the line is stopped for a shorter period. The maintenance facilities UI has two different circles that illustrate the two levels at which they can reduce repair times. Thats all very simple, but coding it was harder than it sounds, combined with the fact that it needed some tutorial pop-ups, and it needed a GUI that looked nice and was also clear and usable. All of that is done, and I’m happy with it, so all it comes down to now is a simple case of getting the numbers right. 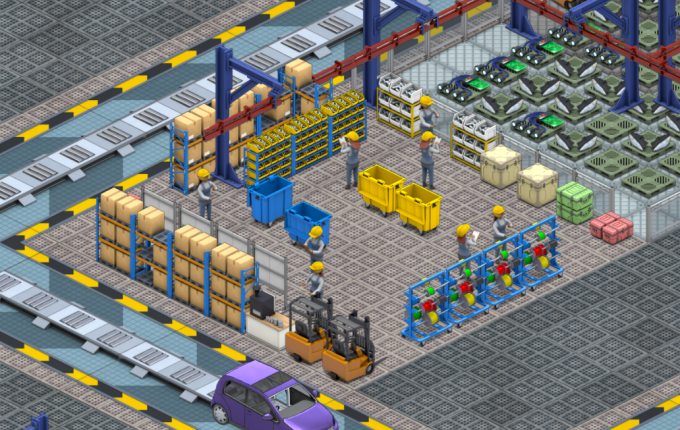 In a game like Production Line, the numbers you set for items are basically the WHOLE game, in terms of long term playability. I can wreck the game immediately by getting these numbers wrong, or less drastically, I can make this new feature and all the work that went into it irrelevant if the numbers are wrong in the opposite direction In an ideal world, the breakdowns introduce just the right amount of complexity, and light-frustration which keeps the game interesting and something that demands the players attention, while the maintenance facilities provide just the right solution, which should come at a price, and with interesting trade-offs. To put it another way: If the breakdowns are no big deal, the maintenance is irrelevant. If they cause mayhem despite maintenance, they make the game worse. Meanwhile if maintenance is too cheap and easy to place, its irrelevant as a decision. Too expensive or difficult and its going to be annoying. There is no real easy way to pick these numbers, they just have to be experimented with. Right mow, the chance of any slot breaking down after completing a task is 1 in 200. The time it takes (in seconds at 1x speed) to fix them is between 24 and 48 seconds. That time is reduced by either 37.5% or 75% depending how close the nearest maintenance slot is. The slot itself costs $98,800 to place, and requires 8 engineers which cost slightly more per hour than a scientist (researcher). Power draw for the slot is equivalent to most other manufacturing slots, and its footprint is 4×4. All of those numbers MIGHT be wrong. Maybe the slot is too cheap, maybe we need more (or less) engineers to adjust the ongoing cost of maintenance? Perhaps the breakdowns are too frequent and annoying? or maybe so rare, and so cheaply fixed by spamming maintenance that the mechanic becomes irrelevant? Hopefully none of the above! and I also think that the fact that maintenance requires research, and has an area-of-effect mechanic will add new interest to factory layouts, both in preventing sprawl (which works against the mechanic) and also ensuring the expert player leaves regular areas for future maintenance facilities that they cannot yet afford, or have not researched. Expect to see this in the next update for the game, and I hope people agree it makes things a bit more realistic and interesting. I like it. Looking forward to giving it a try.